The Jane Hartsook Gallery is pleased to present work by Ghada Amer, Judy Hoffman, Alice Mackler and Ellen Robinson exhibiting their research as Artist-in-Residence at Greenwich House Pottery. The residency at GHP is a distinguished program offering artists an environment to explore and generate new bodies of work in ceramics. Ghada Amer returned this year to complete her second residency at GHP, spending rigorous hours in the studio and developing a tactile expertise with clay. Using this knowledge, she generated a body of ceramic sculptures, both large- scale paintings and miniatures, thoroughly investigating the marriage between the sensual nature of clay and her message of female empowerment. She continues to cultivate this theme further, bridging the span between her painting and ceramic work. Ghada Amer is represented by Cheim & Read in America, Kukje in South Korea and Goodman Gallery in South Africa. 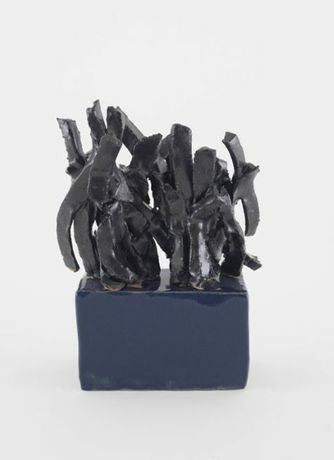 With a studio practice that reflects the characteristics of her work, Judy Hoffman took full reign in experimenting with new forms, parts and surfaces, creating a database of urban, organic sculptures. Hoffman meticulously organized shapes and surfaces from this playful chaos. Her sculptures are constructed by assembling these individual parts. Hoffman utilized the residency as a place to focus and reflect, dedicating time to technical problem solving and conceptual evolution. As a result, her work presents a dream of playful environments that are other-worldly, lively, biological and urban. Judy Hoffman is an American artist living and working in Brooklyn, New York. Hoffman attended the New York Studio School and received her BA from Grinnell College in Iowa. She is a recipient of grants from the Women’s Studio Workshop and the Brooklyn Arts Council. Her work has been included in Sculpture Magazine and the New York Times. She has exhibited in numerous exhibitions including the Museum Frauenkultur, in Fürth,Germany and Bric House in New York, NY. During her residency, Alice Mackler created female figures vibrant in color and grotesque in texture. Mackler immersed herself in the work, connecting instinctually with the tactility of the material. Her background in painting informs her eye for color and source of expression. The residency provided her with the opportunity to further develop eccentric forms and radiating surfaces. Experimenting with scale, Mackler challenged herself to move beyond her 12 inch tall figures, doubling their size. Mackler continues to allure viewers with the quizzical nature of her ruby-lipped females, communicating a body language that is their own. Alice Mackler is an American artist born in 1931 in New York and received her BFA from the School of Visual Arts in New York. Mackler has exhibited in the group exhibitions Unorthadox at The Jewish Museum, New York, NY, The Avant- Garde Won't give Up: Cobra and its Legacy, at Blum & Poe, Los Angeles, CA and Gardens of the Pure at MOCA Tucson. She has also held solo exhibitions at the Independent Art Fair and Kerry Schuss Gallery in New York, NY, 2017. Alice Mackler's work will be included in the upcoming book from Phaidon, Vitamin C, (ceramics). Ellen Robinson’s residency served as a place of quiet contemplation for textural assemblages and soft surfaces. Yet, Robinson transforms these associations into objects full of dichotomies and contrasting impressions. The work invites either a quiet or intense response through her use of monochromatic tones and whimsical arrangement. During the residency, Robinson was able to explore a variety of surface treatments and assemblage choices, working through new forms and ideas. Ellen Robinson is an American artist living and working in Brooklyn, NY. She received her MFA from the School of Visual Arts in New York, NY, where she began working in ceramics. She has been an Artist-in-Residence at the Henry Street Settlement and has shown her work at galleries such as Alona Kagan Gallery in New York, NY, One Main Street Gallery in Buffalo, NY and Diamantina Gallery in Brooklyn, NY.